Secure the rope attachment to the cable machine with the pin set high. Grab both handles of the rope extension and lower the body down to a kneeling position (place a towel on the floor for added comfort). Position the rope behind the head. Pull the torso down with the forehead going towards the floor. Once the body is parallel with the floor (a slight curve in the spine is recommended), hold this position for 1-2 seconds. Slowly allow the torso to come back to the starting position. This exercise should be performed with a weight less than one's own body weight. 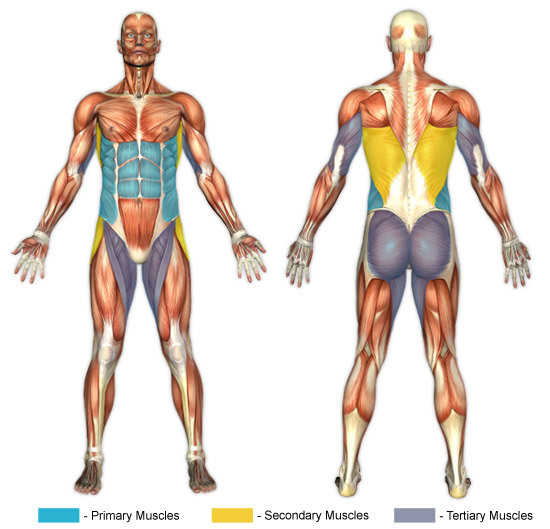 The purpose of this exercise is to target the serratus anterior, abdominals, and the obliques... not the back muscles. Be sure to perform this exercise in a very strict manner, there should be no jerky movements. Rope pulls can be performed facing the weight stack or away from it. If one is performing the exercise towards the weight stack, be sure enough distance is placed between the head and the weight plate or injury may occur.